Jule climbing well through the bottom. Kruder made her way into the start and fell getting into the second double-volume crack. Again next go. Again. 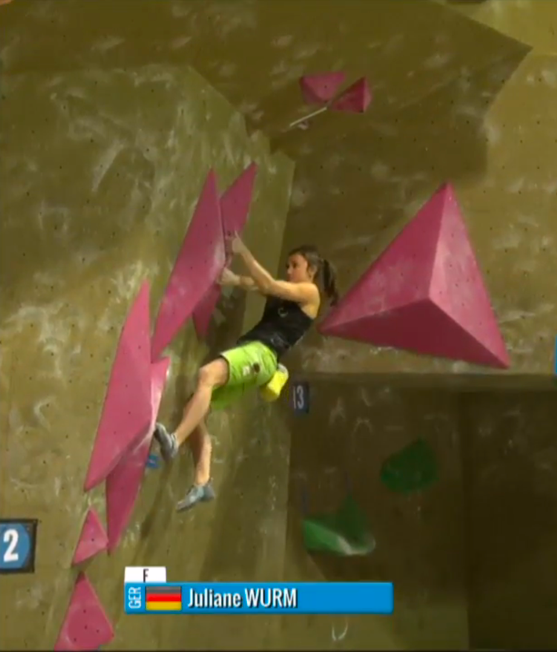 Julija looks miserable trying to do the hand jam or layback in the crack. Falls there again. Puccio easily got up to the press in the roof and the bonus. 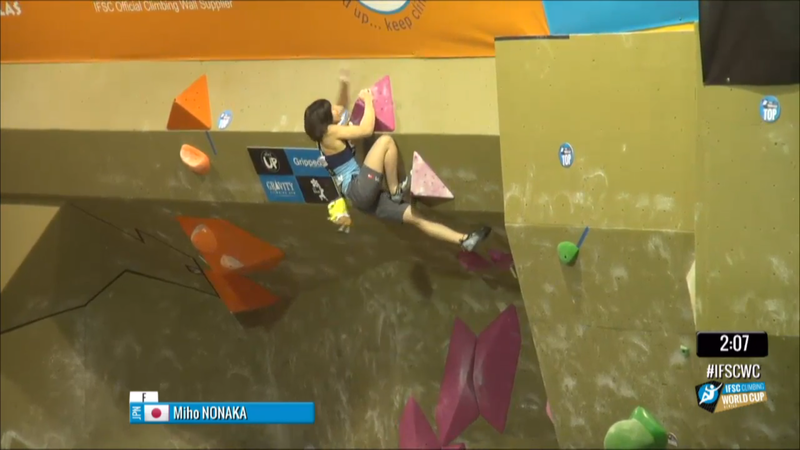 She looked kinda uncomfortable in the corner but made it work under the roof, double underclinging and trying to see the next hold. She gets it, feet to the wall, jump to double screw-ons at the finish, sticks, does a pull-up. Flash. Jule hiked up into the corner under the roof for bonus, sticks, flash. Miho seems to be struggling with the jam but she does get it to work. She climbs very slowly. Presses out to the volume and up into the corner and bonus. Up and around the headwall, sticks finish, flash. Shauna got up into the corner, to bonus, flashed. Akiyo climbs slowly to be perfect, flashes. Sean about to levitate to the green disc. Mondet came off on the first big green disc before bonus. Fell there again. Again. 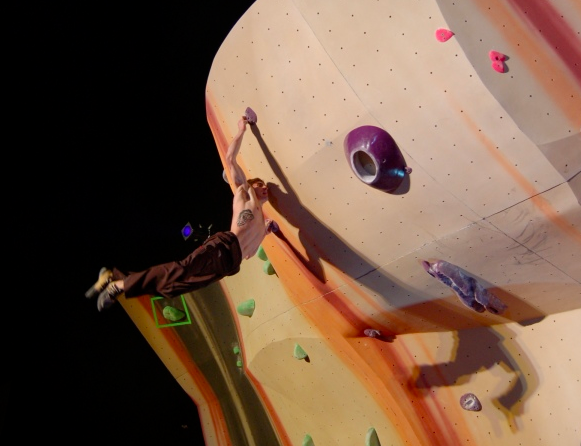 Seems to be a left/right 1-2 with right catching a volume to keep the climber on the left hand. He almost sticks it without the volume next go, but falls. Almost sticks again. Keeps feet on with a toehook and sticks, goes to bonus, shuffles up with a heelhook, presses to top volume, catches it, over the lip to the finish. James tried to mantle on the volume but it didn’t work and he fell. Fell again. Stuck green disc like Guillaume, rocked on heel to bonus, slipped but didn’t fall off, slipped again and off. Off again. Double-dynos to first disc and catches it, gets a better heel this time with a low hand, gets on bonus with both hands, statics to next volume, feet cut but he campuses to the finish. Nice! Rustam uses the volume edge instead of the start hold and tries to jump, misses. Next go gets off left, falls again. Tries to double-jump and falls. Next go jumps quickly with both hands and sticks. Hits bonus but slips off, not sure if he got scored for it but probably. Announcers are saying he needs to move slower. Falls again on 1st jump move. Again. Again. Done. Jongwon falls going right hand only to the first green disc. Falls there again. Sticks it and falls. 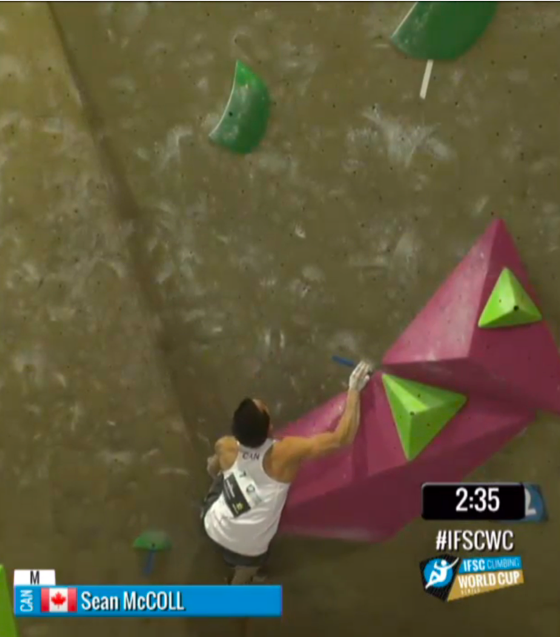 Gets bonus, has trouble but wraps right hand on top of the bonus, matches in, jumps to next holds no problem. Sean fell on the bottom. Again. Really seemed to struggle with it. Fell again, nearly stuck one hand 3 fingers. Rested for a few, then stuck it with both hands. Looked really hard. Hit bonus but fell, not sure if it was scored. Next go he stuck the start move easily, placed his heel better with the low hand, matched bonus, looked much better but stuck, swung up to high volume, swung off. Bummer. Jan fell on the 1st move. Next fell hitting green disc with one right hand like McColl did. Next go he stuck, got bonus easily, matched, jumped easily to next volume and top. Seems like being taller is definitely helping on these, watching Jan’s body position vs Sean McColl’s.